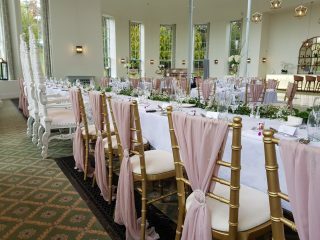 For this wedding we used our gold Chiavari chairs with ivory drapes. 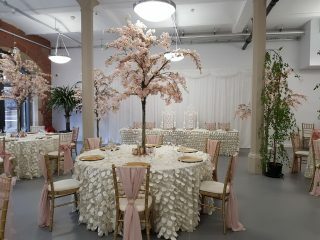 The look for the wedding ceremony was completed using our warm white luxury aisle carpet. 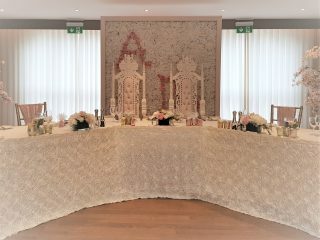 We have a selection of table linen in various colours, textures and fabrics. 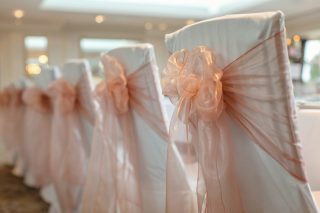 Our chair covers are made to measure the chairs at your chosen venue. 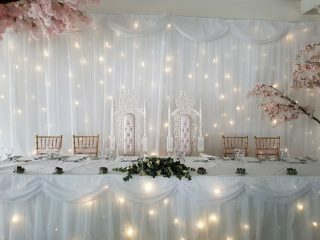 Our Starlight backdrops are simply stunning, add a starlight table skirt to your top table to finish the sparkly look. Our Trio of Vases is a popular choice. it can be styled in a number of ways to fit in with your wedding theme. 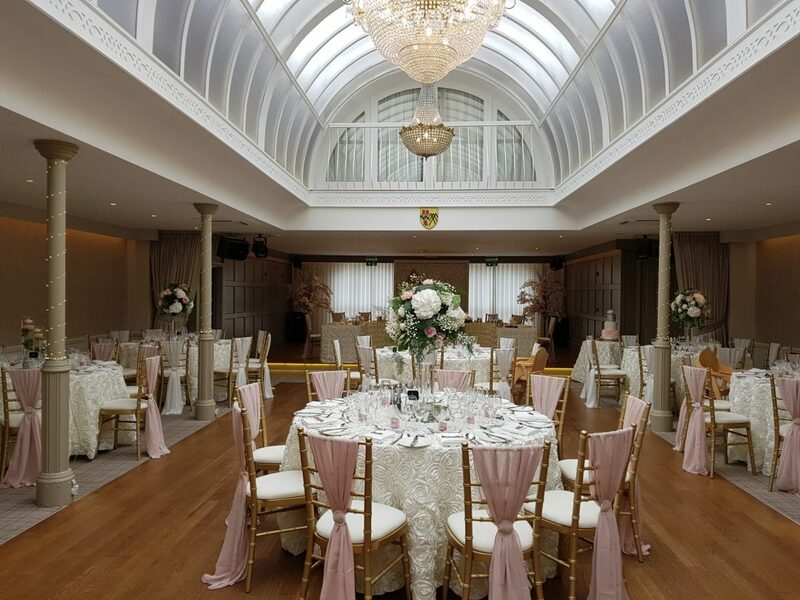 Our pale gold Chiavari chairs look stunning in any venue. Planning a Wedding has never been so much fun. View our catalogue for your wedding inspiration. How did we style this look? 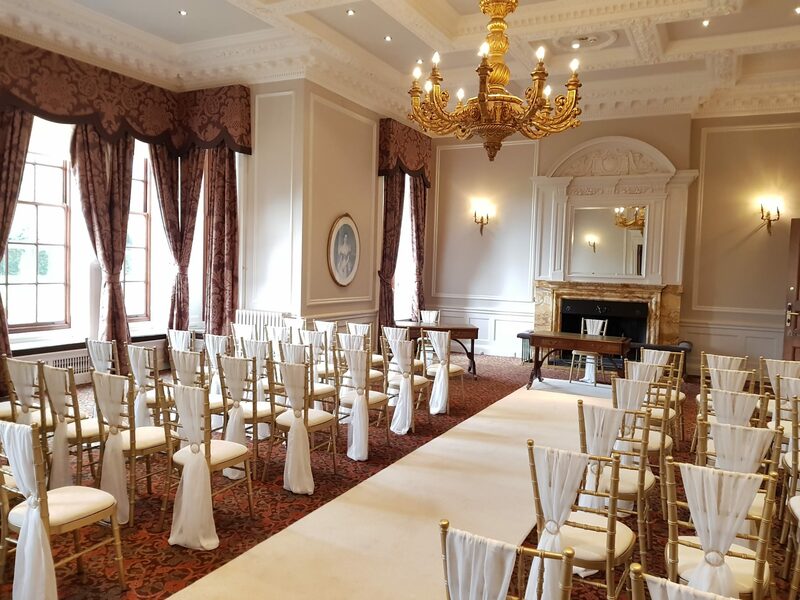 Our gold Chiavari chairs look stunning in most venues. The chair drapes, with added touch of sparkle using diamante buckles, add the perfect touch of elegance. 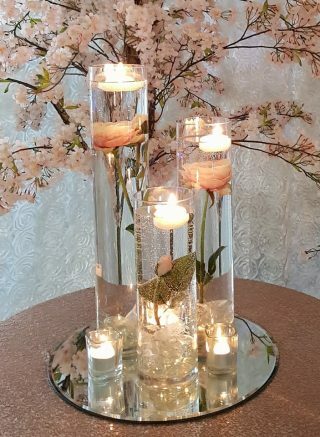 An elegant centrepiece to suit most wedding styles. Our Trio of Vases with flowers that can be added to compliment your style or colour theme. 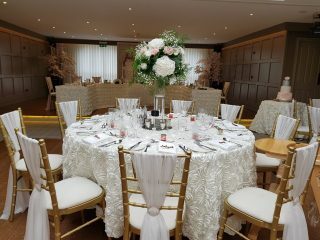 The rosette table linen, used here in Ivory, is available in a range of colours. Our white throne chairs make the Bride and Groom feel extra special when seated at their table. 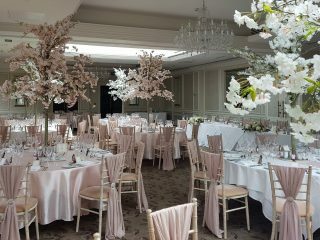 We will tailor your wedding decor to your needs and create a bespoke wedding decor package that is as indvidual as you. Check our reviews to give you peace of mind that we will provide a great service. We guarantee that what you have envisaged for your day we will provide. 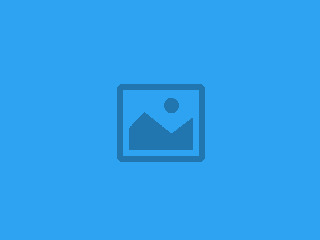 “We used the First Class Wedding company for our wedding on the 28/12/18. 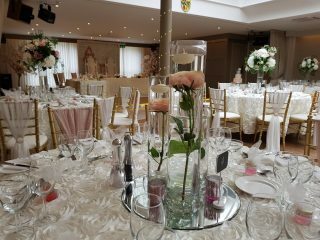 We hired the gold Chiavari chairs and the white sequin table cloths. They made a perfect addition to the venue and looked beautiful. View more of our customer reviews here.